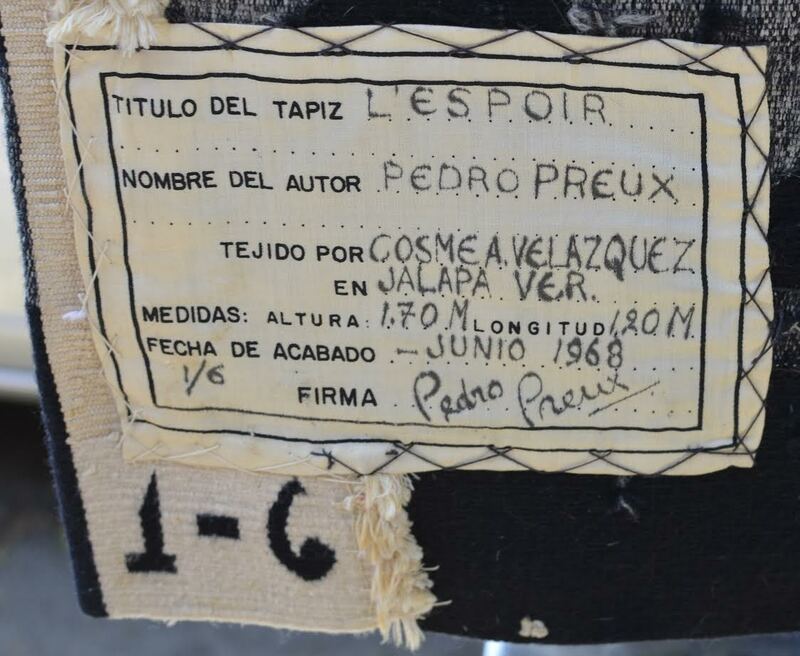 Pedro Preux (1932-1911) L’espoir (The Hope) tapestry in cotton and wool #1/6 created in June 1968, Cosmea Velasquez – Jalapa, Veracruz. 65 x 47″ approx. p.o.r. This is such an interesting piece. I thought it was lost for many years and recently rediscovered it in a box. In the meantime Preux has had a major posthumous show at the Central Gallery of National Arts in Mexico City and a book. This piece needs to be appreciated contextually, its birth in June of 1968, think of the context of the Olympics and riots in Mexico City during that time. 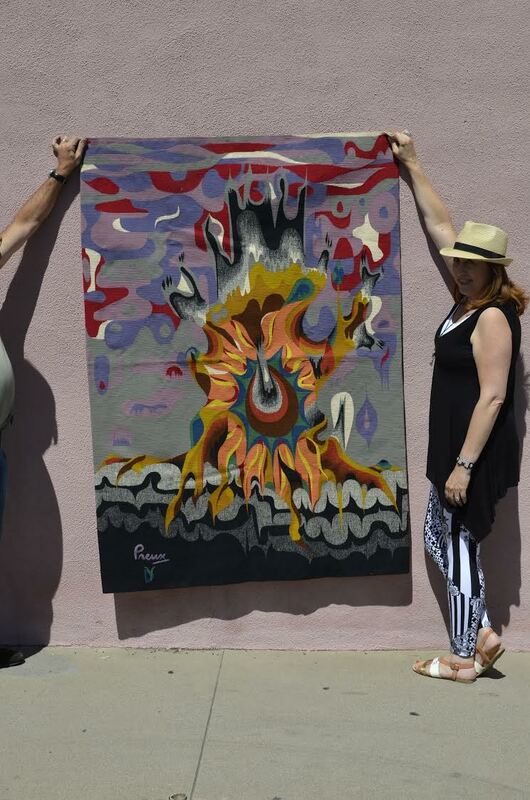 The social tumult giving rise to the artist’s vision of a phoenix of hope arising from the ashes. Beautifully made please check out the Wikipedia entry on the artist. 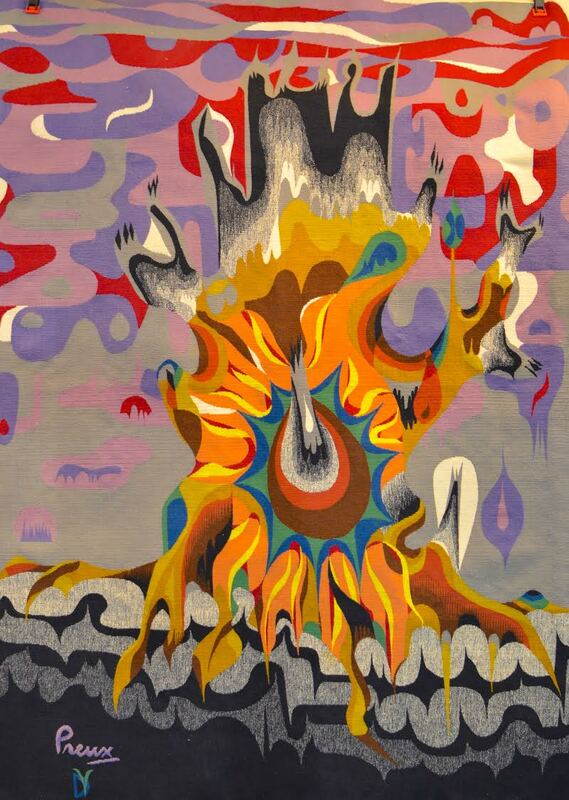 Pedro Preux was born in Paris to Roberto Preux, a painter and Sonia Lernau, a sculptor and tapestry weaver. He began to learn artistic skills from his parents, studying violin and architecture as well. He and his family immigrated to Mexico in 1942, arriving alongside a wave of Spanish exiles to the country. He later became a naturalized citizen of the country. Preux did not have any formal artistic training. However, he received scholarships from the French government in 1961 and 1965 to study tapestry making in Aubusson and in Gobelins Manufactory, the official factory in Paris. Here he apprenticed under Jean Luçart. Although tapestry making as an art form waned after the 1970s, Preux remained an active artist until his death, in 2011 from an embolism. He left behind a daughter, Mónica Preux, a singing teacher at the Universidad de Sonora, and a large collection of contemporary tapestries from around the world.